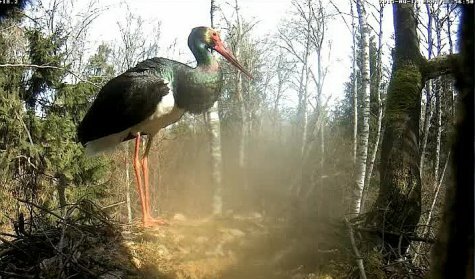 There are two black stork nest cameras, one in western Estonia and the other in South Latvia. The Estonian nest has had a web camera from 2011 onwards. It may stay unoccupied this year: last year a male stork appeared at the nest and broke all the eggs. After this the female left the nest and never returned. The nest has been visited by a black stork this year but it is not clear whether it is a bird already known to us. Permanent residence has not been established yet. When the birds arrive at the nest we will let you know. The Estonian black stork camera is supported by the Estonian Environmental Investments Centre. The necessary practical work was organized by Renno Nellis. The nest is located in the Latvian Zemgale (Semigallia) region, in a landscape with the towns of Jaunjelgava and Jēkabpilsi at the northern edge and the village of Ērberģe in south. The nest is in an old oak that grows in an old forest, on the bank of a stream (the sound of the stream can be heard in the camera). The nest is known from 2013, but then the nesting period had ended. Last year two storklets fledged from it. The adults have no rings, neither last year nor now, so their age and origins are not known. Jānis Kažotnieks, Māris Strazds and Torben Langer helped to install the system in Latvia.